Just like most families, mine has no shortage of issues. There have been and still are substance abuse problems, mental illness, verbal and physical fights, bad habits, cruelties administered and/or said in anger. But overall, I come from a loving family and one of the best things about us is that we do not hold grudges. We give each other plenty of reasons to hold grudges, but we always forgive each other and have just as much fun at our next family gathering as we did during the last one. We hurt each other, we drive one another crazy, but we don’t even have to say we’re sorry in order to move on. We just do. The Miller family 2007 (back): Al (FIL), Lance (nephew), Richard (BIL), Joan (SIL), (front) Phyllis (MIL), Carson (nephew), Dennis and me. While Dennis got the raw end of the deal with his crazy in-laws, I got an unexpected blessing. I married into the “plastic family.” That’s what I used to call his family (behind their backs, of course-lol) because they were so perfect (like Barbie and Ken with their children in my childhood dream world), I couldn’t see how they could be real. 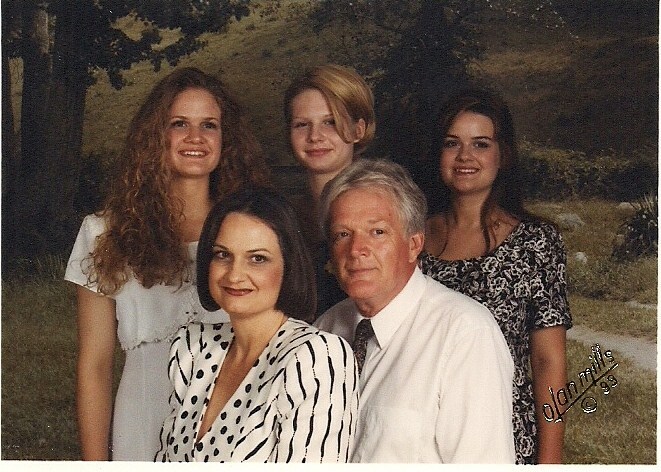 A real family had deep and major issues, they yelled at each other at the top of their lungs, threw glasses across the room and pulled hair, the Moms threw their daughters through walls and had nervous breakdowns every summer, the daughters got arrested for marijuana possession and suffered from anorexia and binge-eating, the Dads were alcoholics, and every so often a 300-lb steel desk in the home of a real family would get thrown down the stairs. Only a “plastic family” could be so gentle, so understanding, so soft-spoken and happy all the time. Me holding my baby sister, Lacey...with a knife. Do you question the dysfunction? I thank God for my new plastic family. :) Without them, I might have never known that a better sort of “real” could exist. It was in my mother-in-law’s kitchen that I first got the idea to start my Thankful Thursdays feature, while I was overwhelmed with joy to be preparing scalloped potatoes with her (something that will never happen in my mother’s kitchen). She isn’t as goofy as Dennis, but I think I can safely say that he got his wonderful sense of humor from her, and I’m thankful for that too. I love spending time with them all because they are not only kind and loving, but fun-loving and the laughter is always plentiful. Now, that’s another thing my blood family has going for them. The laughter. It has seen us through every battle, and is perhaps our strongest bond. My Dad can find the humor in any situation, and in fact just recently was cracking up, and cracking me up, while telling me about a fight he and Mom had in which she locked him out of the house. He lifted his foot to kick down the door, but lost his balance and fell backwards, then couldn’t get up. Mom unlocked the door in response to his yelling, only to laugh uproariously at him before helping him up and letting him back in. My family isn’t the most functional one on the block, but hey, at least we can laugh about it, forgive each other, and love each other despite ourselves. So what about you? Are you from a real family or a plastic one? And what about yours are you thankful for? I liked your post. My family provided me with more writing material then I will ever be able to use in one lifetime. I am blessed for the fountain of creative knowledge, energy and multiple cultures. I would not give them up for anything but I would not rank them ahead of my friends. I consider my friends my soul family and they keep me grounded on this earth. Great pictures! You look just like your parents. Oh Veronica! What a wonderful post. I think all of us have some disfunction somewhere. My own family and my husband’s family are both very different. My family is less “disfunctional” but is quick to judge and find fault with anyone who is different. Sometimes it keeps me from “being me” in their presence… My husband’s family is more welcoming of all scenerios, but in being that way, they are also too forgiving, too quick to make excuses and ENABLE substance abuse problems, OCD and serious anxiety issues, and that causes its own set of problems. However, I have carved my own family out of the two. I find myself extremely liberal and yet conservative (is that possible?). I think the extremes in all of our families make us who we are. Thank you for sharing. I always love reading your posts! I absolutely love you Thankful Thursdays! I look forward to them every week. I especially found this weeks to be fun as we all have dysfunction to our families and it is nice to know that I am not the only one. The picture of you with baby and knife in arms–WOW! =) I would say my family is as perfect as I could hope for, but with a little history thrown into the mix. I really can’t complain–my childhood was awesome. And the strife during some of my teenage years did teach me a lot, though it wasn’t always fun. My bio family is way mentality unstable! When I was fourteen I moved with a caring, loving family and still consider them my family :) I stayed with them until my late teens, then went out into my world on my own. My husband’s family too, is kind and generous and what I would deem to be normal. Glad to see you back! I like to say that every family is dysfunctional on some level. I used to get so mad b/c I had the crazy family and my husband’s was perfect like your in-laws. That is until I spent some extended family reunion time. They are as crazy (normal) as the rest of us. Glad you’re posting again. Ummm yeah. My family is definitely like your real family. To a “t”. And I love them for it. Veronica – so glad that your “plastic family” is actually real :D And that picture of you holding your baby sister with a knife (and I see some rope on the side) is priceless!